If you’re a fan of novelty pop crazes (and as you’re reading ANBAD, you probably are), then you’ll love the fire raging around the discovery of Portuguese Pimba pop elsewhere on the site. Everyone’s jumping on the ludicrously vulgar bandwagon, and perhaps you should too, if you love summery drinking songs with crude double-entendres about penises. 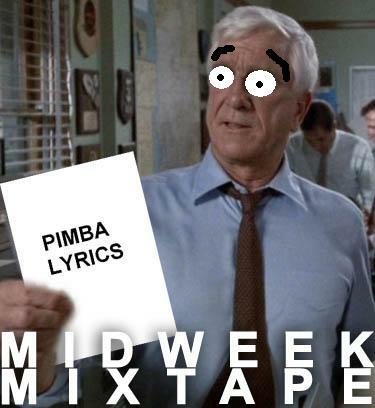 Lt Drebin has just translated some of those offending lyrics. Be warned, schoolboy humour in pop might take over here too. MIXTAPE! FIRST! Teleprompter have pulled off a neat trick: to nick 1980’s-era Beastie Boys lyric delivery (COMPLETING the END of each other’s SENTENCES with shouty bits) and coupling it with buzzy pop that the band describes as punk, but is actually a lot more relevant than that. A pleasantly mindless blast. SECOND! Everyone loves RAWK, right? Sure you do, even the skinny fey boys with ludicrous trouser turn-ups. Gordon Fights are a Swedish heavy rock band, which means you get the best of both worlds: crunchy riffs, and the innate Swedish application of candied-melodies. Nice. THIRD! Continuing our jaunt around the outer reaches of Northern Europe brings us to Iceland, where Svavar Knútur has recorded a cluster of Icelandic folks songs, and guess what? They sound like beautiful nursery rhymes played backwards. Lovely. FINALLY! Inch-time has a bundle of sweeping, delicate electronic burbles, and he wants to share them with you – assuming that the softly looping nature of Videograms hasn’t caused you to drift into a deep slumber already. Feathery. Posted on June 22, 2011 by Joe Sparrow. This entry was posted in Headline, Today's New Band. Bookmark the permalink.